In his essay Why I’m Not a Negative Utilitarian, Toby Ord shows himself surprised to see that some of his friends and acquaintances in the effective altruism community identify as Negative Utilitarians, although negative utilitarianism is discarded in mainstream philosophical circles. Is negative utilitarianism (NU) an implausible theory? Versions of NU which overrule compensation within the same person (like Absolute NU, Lexical NU and Weak NU) could be called implausible theories, but not versions of NU which question compensation across different persons (like Modern NU). Modern NU is a metric within modern hedonistic utilitarianism, which is functionally equivalent to prioritarianism. - Prioritarianism does not exclude negative totals, but is usually associated with distributive justice and positive totals. - Modern NU, conversely, does not exclude positive totals, but NU is usually associated with negative totals. From a strictly hedonistic perspective a world without humans is preferable to a world with negative total well-being. But the non-existence of humans is no realistic option. We only have a choice between more or less suffering populations. If there is a life-friendly way to turn the total positive (e.g. transhumanism) then NU is not hostile to the existence of life. The totalitarian potential is not a peculiarity of NU, but a characteristic of consequentialism in general. Adherents of NU, who recognize totalitarianism as a problem, amend their theory with human rights. Such a moderate form of NU corresponds to a political party within a democratic system. From a NU point of view the utilitarian ranking of nations has to be reformed. The current indices suggest that negative well-being and traumatic events can easily be compensated. In his essay Why I’m Not a Negative Utilitarian, Toby Ord shows himself surprised to see that some of his friends and acquaintances in the effective altruism community identify as Negative Utilitarians, although negative utilitarianism (NU) is discarded in mainstream philosophical circles. Is negative utilitarianism an implausible theory? A further criticism of the Utilitarian formula “Maximize pleasure” is that it assumes, in principle, a continuous pleasure-pain scale which allows us to treat degrees of pain as negative degrees of pleasure. But, from the moral point of view, pain cannot be outweighed by pleasure and especially not one man’s pain by another man’s pleasure. Instead of the greatest happiness for the greatest number one should demand, more modestly, the least amount of avoidable suffering for all [Popper, Volume I, Notes to Chapter 9, Note 2, 317]. The context of Popper’s notes on ethics was the fight against the greatest and most urgent evils of society. The statement “From the moral point of view, pain cannot be outweighed by pleasure ….” has to be associated with traumatic cases of suffering (like the horrors of Auschwitz) and not with the pain of a pinprick. It is counter-intuitive to deny compensations/trade-offs in cases like the birth of a child, cosmetic surgery etc. [Fricke, 16]. Toby Ord dedicates a considerable part of his paper to the refutation of the Absolute and Lexical NU, possibly because the term negative utilitarianism (NU) originally referred to these versions (see e.g. R.N.Smart, Negative Utilitarianism). But Absolute NU and Lexical NU are simply misinterpretations of Popper’s notes on ethics. Suffering and happiness both count, but suffering counts more. 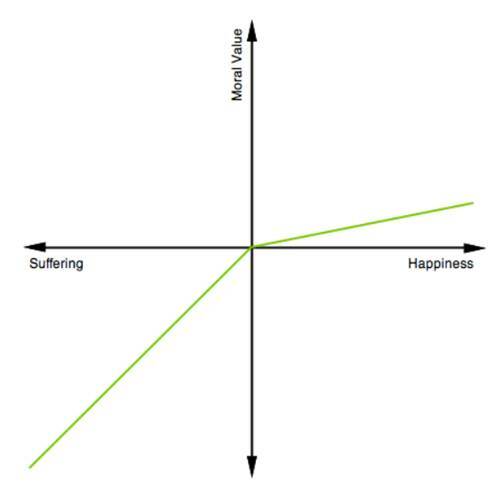 There is an exchange rate between suffering and happiness or perhaps some nonlinear function which shows how much happiness would be required to outweigh any given amount of suffering [Ord]. The term suffering counts more distinguishes the Weak NU from classical utilitarianism. The latter assumes that suffering and happiness have equal weight. Toby Ord applies this definition to intra-personal compensations. But what is the horizontal scale supposed to represent? There is no obvious natural unit of suffering or happiness to use. It might be possible to have a consistent scale in the happiness direction and a separate consistent scale in the suffering direction, but it is very unclear how they are both supposed to be on the same scale. This is what would be needed for Weak NU to be a coherent theory and for the diagram to make any sense [Ord]. 1. Happiness and suffering are comparable; otherwise there would not be compensations/trade-offs. If happiness and suffering are comparable, then they can be arranged on the same scale. 2. The scale of happiness and the scale of suffering touch each other, at the point where suffering and happiness are zero. There is no incoherence or discontinuity in a mathematical sense. ▪ Classical utilitarianism assumes that suffering and happiness have intrinsic moral value, so that they can simply be aggregated. For example, in some cases the Weak NU will say that it is immoral to watch the end of the film while you are really hungry, even if this tradeoff increases your wellbeing, because the suffering counts more morally [Ord]. ▪ the Weak NU overrides the personal evaluation and asks for leaving the cinema. ▪ In the Absolute NU watching the end of the film is worse for everyone, because happiness is completely devaluated. ▪ In the Weak NU watching the end of the film is only worse for persons with a corresponding exchange rate between suffering and happiness. Independent of Ord’s wording the cinema example is a valid example to illustrate the implausible mechanism of the Weak NU. A similar refutation can be found in Fabian Fricke’s article [Fricke, 14-16]. Now, the rational course of action depends on the probabilities assigned to the two relevant events. If the agent has determinate probabilities over the two events, it is easy to confirm that she should take the job in Chicago so long as the probability of a plane crash is less than one percent, and stay in New York if it greater than one percent; if the probability is exactly one percent, she is indifferent, and is rationally permitted to take either job [Angner, 13]. ▪ The majority assigns e.g. -89 to the plane crash (instead of -890) and therefore takes the job in Chicago. Harsanyi associates this behavior with risk-neutrality, utility maximization and rationality. ▪ A minority assigns e.g. -8900 to the plane crash (instead of -890) and therefore – with the same assumptions about probabilities – denies the job in Chicago. Harsanyi associates this behavior with high risk-aversion and irrationality. But possibly the minority is just more sensitive for suffering. From the external perspective the minority’s behavior seems to be risk-averse, but from the inner perspective it is risk-neutral. The minority feels suffering stronger and therefore acts as rational as the majority. To override individual attitudes towards risk is as questionable as overriding the individual evaluation in the cinema example. The Weak NU is an implausible version of NU. So far we assumed that everyone strives to maximize his/her individual utility. But maximizing individual utility may not be the best strategy for maximizing the societies’ total utility. In above example it may e.g. be better for the person to take the job in Chicago, but worse for the global climate, because of the environmental impact of aviation. Morally right – in a strict consequentialist sense – is only the action which maximizes the societies’ total utility. In the following we adopt Popper’s view and abstain from defining a utility function for intra-personal compensations/trade-offs. We will assume that individual well-being is assessed by means of surveys on subjective well-being (as in happiness economics) and not by means of calculation as in neoclassical economics [Hirata, 26]. In this context the term happiness is a synonym for life-satisfaction, well-being and positive welfare. The term negative welfare accordingly stands for uncompensated suffering [Fricke, 18]. For the purpose of NU surveys have to use a hedonistic scale with positive and negative numbers. The following example shows that such scales are not self-evident. We have excluded Absolute NU, Lexical NU and the Weak NU because they override intra-personal compensations/trade-offs. The vertical axis does not contain negative values. Death has value zero, so that it is better for everyone to be alive. Voluntary Euthanasia is necessarily immoral, because it destroys positive value instead of eliminating negative value. NU, in contrast, asks for an axiology which allows negative values. It maintains that overriding the personal evaluation in the hospital is as questionable as overriding the personal evaluation in the cinema example above. If a person feels that his/her suffering cannot be compensated with happiness [Fricke, 18], then NU assigns a negative well-being to this person and not – like most QALY models – a low positive value. The situation is then characterized by a choice between the two evils suffering and death. For the purpose of NU a scale which does not know negative numbers (e.g. a point scale from 1 to 10) has to be converted into a signed scale. There is a well-known moral intuition that we should prioritise helping the worse off and this is much more widely accepted than NU (…). Such an intuition can be accounted for in the theories of Prioritarianism, Egalitarianism, and Sufficientarianism [Ord]. The Modern NU is functionally equivalent with Prioritarianism, so that Ord’s objection does not apply. For more information about the Modern NU see Negative Utilitarianism and Justice. No amount of happiness or fun enjoyed by some organisms can notionally justify the indescribable horrors of Auschwitz [Pearce]. The Modern NU accepts the intuition that suffering can be counterbalanced by happiness, but maintains that – depending on the kind of suffering – very much happiness may be needed. If the happiness amount needed is immense, then the Modern NU approximates the Lexical Threshold NU. That solves in practice (not in theory) Tomasik’s concern with the three inconsistent intuitions. The Modern NU can model the case in particular, where the happiness amount needed to counterbalance global suffering does not exist on this planet. If global well-being turns negative, then the maximization of happiness turns into a minimization of suffering. The rationality of this intuition is confirmed in The Denial of the World from an Impartial View. Consequently the Lexical Threshold NU is dismissed because of the continuity argument [Ord] and not because the underlying intuition is irrational. Weak Practically-Negative Utilitarianism = Classical Utilitarianism with the empirical belief that it in many common cases it is more effective to focus on alleviating suffering than on promoting happiness [Ord]. Does it make sense to use the term negative utilitarianism for an empirical belief or a cost-benefit analysis within the classical utilitarian axiology? It probably adds to clarity, if we reserve the term negative utilitarianism for the application of an asymmetric scale, as in the Modern NU (chapter 2.3). An asymmetric scale constitutes a theoretical priority of (the avoidance of) suffering [Fricke, 14]. Strong Practically-Negative Utilitarianism = Classical Utilitarianism with the empirical belief that suffering outweighs happiness in all or most human lives [Ord]. The term “in …human lives” (as opposed to “across …human lives”) makes clear that this definition addresses the compensation of suffering and happiness within the same person. Again, it is rather confusing to use the term negative utilitarianism for an empirical belief within the classical utilitarian axiology. The Weak NU, in contrast, uses an asymmetric scale for intra-personal compensation and is therefore clearly different from classical utilitarianism. Another potential cause for confusion is the interrelation between NU and population ethics. You may think that a clear case for NU is comparing the alleviation of present suffering with the creation of new happy lives. However, this case brings in changing populations, which is the topic of population ethics. The intuition might not be to do with suffering and happiness per se, but to do with the lack of value in creating new lives in comparison to improving existing ones. If this is what guides you, then you should consider views such as Presentism or Critical Level Utilitarianism, which deny that adding a happy life is good, while agreeing that adding happiness to existing people is good and even that preserving the life of existing people is good [Ord]. The idea that adding a life with positive welfare does not make a population better (also called Prior existence utilitarianism or Asymmetry) has a theoretical deficiency [Arrhenius, 137]. ▪ From a strictly hedonistic perspective a world without humans is preferable to a world with negative total well-being. However, as David Pearce emphasizes, the non-existence of humans is no realistic option. We only have a choice between more or less suffering populations. If there is a life-friendly way out of suffering (e.g. transhumanism), then the Modern NU is not hostile to the existence of life, see Antinatalism and the Minimization of Suffering. ▪ From a NU point of view the utilitarian ranking of populations has to be reformed. The current indices suggest that negative well-being and traumatic events can easily be compensated. The Modern NU, in contrast, strengthens the awareness that the suffering minority pays the price for the happiness of the majority. It can reveal cases in particular, where the average well-being improves and the situation of the most suffering minority worsens. For more information about NU indices see Negative Utilitarianism and Justice. ▪ There is an empirical argument against this scenario. A health care system with above characteristics would provoke an immense distress and eventually produce more suffering than it pretends to avoid. One could argue that empirical arguments against moral killing are not convincing under all circumstances, but similar deficiencies can be found in positive utilitarianism and prioritarianism, see the section about Human rights and the higher purpose in Negative Utilitarianism and Justice. ▪ Hospitals often use an axiology which does not know negative well-being, the so-called qalys (see chapter 2.3). In this case we are confronted with a reversed kind of theoretical deficiency. A horribly suffering patient cannot escape from his/her situation by voluntary euthanasia, because non-existence is defined as worst case. Adherents of consequentialism, who recognize the totalitarian potential as a problem, amend their theory with human rights. An anti-totalitarian health care system (in the spirit of Karl Popper) respects the individual’s will to extend lifetime, as well as the right to palliative care and voluntary euthanasia in well-defined and controlled situations which prevent abuse. There is also a type of example that is phrased in terms of whether it would be right or wrong to create a utopia if the very foundation of that utopia required the forced suffering of the innocent during its construction [Ord]. Again, this kind of conflict can be found in all consequentialist ethics. Strictly speaking one would have to distinguish between moderate and radical negative utilitarians, prioritarians, positive utilitarians etc., where the moderate respect human rights. However, if we talk – like Toby Ord – about negative utilitarians within the community of effective altruism, then we do not need this specification, because we know that this community respects human rights. ▪ Prioritarianism does not exclude negative totals, but is usually associated with distributive justice and positive totals. ▪ Modern NU, conversely, does not exclude positive totals, but NU is usually associated with negative totals. ▪ From a strictly hedonistic perspective a world without humans is preferable to a world with negative total well-being. But the non-existence of humans is no realistic option. We only have a choice between more or less suffering populations. If there is a life-friendly way to turn the total positive (e.g. transhumanism) then NU is not hostile to the existence of life. ▪ The totalitarian potential is not a peculiarity of NU, but a characteristic of consequentialism in general. Adherents of NU, who recognize totalitarianism as a problem, amend their theory with human rights. Such a moderate form of NU corresponds to a political party within a democratic system. ▪ From a NU point of view the utilitarian ranking of nations has to be reformed. The current indices suggest that negative well-being and traumatic events can easily be compensated. I would like to thank Brian Tomasik and Simon Knutsson for their helpful comments and suggestions during the review of this paper. 3. Broome John (1991), Weighing Goods, Oxford: Basil Blackwell. 5. Diener, Ed, and Robert A. Emmons. 1984. “The Independence of Positive and Negative Affect.” Journal of Personality and Social Psychology 47: 1105–1117. 7. Harsanyi John C. (1975), Can the Maximin Principle Serve as a Basis for Morality? A Critique of John Rawls’ Theory, American Political Science Review 69: 594-606. 10. Pearce David, Negative Utilitarianism: Why be negative?